Floods in urban areas will become more frequent, warns Delhi-based non-profit Centre for Science and Environment (CSE), if urban wetlands are not preserved along with better urban planning. CSE conducted a workshop in association with All for Water for All, a Puducherry-based non-profit on the state of water bodies in southern India. “This is the right time for holding this workshop in Puducherry as this city along with Chennai has just experienced an extreme flood episode. 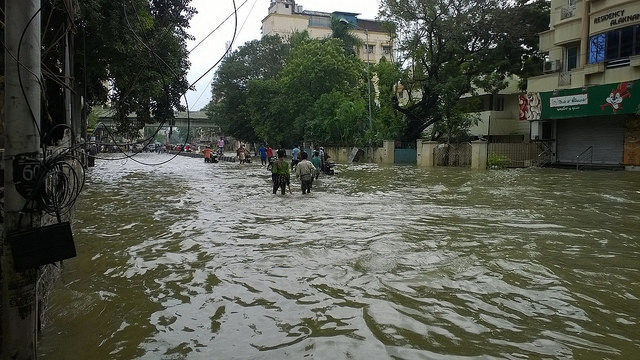 Our assessment is that floods in Chennai were exacerbated by encroachment of water bodies and destruction of city’s natural drainage systems,” said Chandra Bhushan, CSE Deputy Director General. Bhushan said four major issues were perceptible for increased urban flooding: bad urban planning, encroachment of water bodies, increase in extreme weather events and lack of preparedness. He added that increased rainfall intensity and urban flooding would become a norm rather than exception unless corrective measures were taken immediately. “We will have to protect our water bodies, and also be prepared for these events,” he said. Bhushan pointed out the cases of three recent flooding cases – Chennai, Mumbai and Leh – which received many times their monthly rainfall in a just a few hours. A CSE publication "Why Urban India Floods" was released during the workshop by Bhushan, former member of the Planning Commission A Vaidyanathan, and Probir Banerjee from All for Water for All. Other participants at the workshop included Indumati Nambi from Indian Institute of Technology, Chennai, TV Ramachandra from the Indian Institute of Science, Bengaluru, and Leo Saldhana, ESG, Bengaluru among others. CSE’s expert on water Susmita Sengupta said since groundwater was not considered to be critical for water supply, recharge was neglected by urban planners as they valued land, not water. “There is no legal protection for city lakes, catchment and drainage systems. Water bodies and their catchment have been encroached upon or taken away for housing and other buildings,” said Sengupta. CSE analysis shows that in South India, the loss of lakes had been widespread. In 1960, Bengaluru had 262 lakes, but today not even 10 lakes are in a healthy state. Hyderabad, too, is losing its water bodies. Between 1989 and 2001, 3,245 hectares (ha) of water bodies were lost, which is 10 times the size of Hussain Sagar, the major water body of the city. Chennai’s flood sink–the Pallikarni marsh–which was around 5,000 ha at the time of independence got reduced to almost 600 ha around 2010-11 due to urbanisation and mismanagement. “The government’s own studies accept that the waterways in Chennai convey treated and untreated sewage and garbage together. These waterways, which are also the city’s flood discharge channels, are encroached and built upon as well, severely reducing their flow,” said Sengupta. CSE’s analysis shows that the areas which suffered the worst floods in Chennai were the areas where water bodies were encroached. There is a need of strong laws to protect urban lakes, or people will be forced to go to the court to identify and protect the water bodies. Protection of lakes is just half the story – the catchment and feeder channels should be protected too. This is because the real challenge lies in filling up the water bodies with clean water. Urban planning should be integrated with the study of the geology and the hydrogeology of the area so that new developments are not at the cost of the lakes and wetlands. Policy-makers should also revisit the development projects to see that they do not interfere with the hydrogeological cycles. There should be an umbrella authority to protect and conserve the water bodies. The Central government should provide funds for water supply to only those cities that have brought their own water sources under protection. The cities must show they have optimised local water potential before claiming access to water from far away sources. The city can invest the saved money in treating sewage which pollutes the lakes and ponds in the first place.